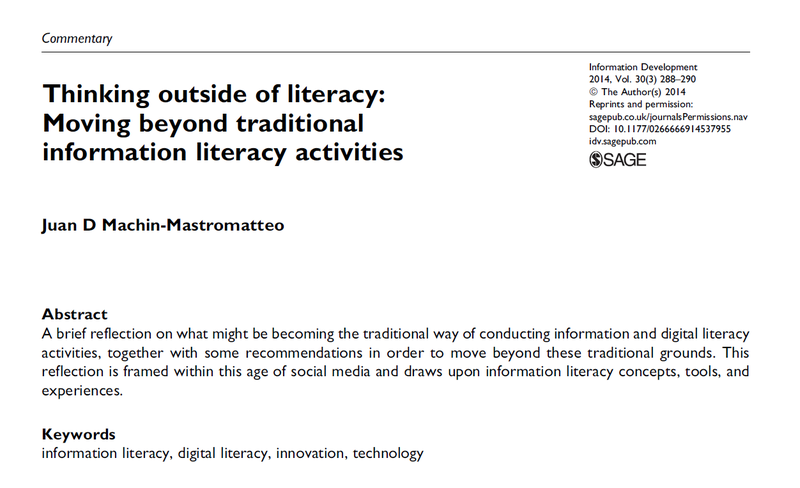 On July 23 2014, I published a commentary in the academic journal Information Development (published by Sage), titled Thinking outside of literacy: Moving beyond traditional information literacy activities. This reflection is framed in the field of information literacy, a dynamic area of practice and research that is typical of Library and Information Science, which contains the competences to access, use and evaluate the information effectively. This field also includes the use of information and communication technologies and participatory media such as social media. This text offers some suggestions from my practical and research experiences in order to foster a professional reflection upon how we can overcome from these traditional ways of conducting information literacy activities; which are vital for developing an information culture, for university environments as well as for society. a) Resource specific training: are basically software demonstrations, very common in libraries when we train users about the use of a technology or an information resource. Its problem is that it seems difficult to keep it dynamic for students, if it is not possible to add a practical component, such as doing problem based learning. b) Theoretical teaching of information skills: these appear in some international standards and curricula that do not usually specify how do these competences apply to areas of the human or professional profiles that is to be developed. Their challenge is that the student and even the teacher will not necessarily going to understand how to transfer these competences to academic or life scenarios. These criticisms do not mean to say that these variations of methods to develop information competences are wrong. Conversely, we the teachers must consider both and seek for a third way that integrates the previous two while we discover how to get beyond. It is important to keep at hand these kinds of reflections about how to develop an information culture in our students (and thus these transfer to society) and above all: to discuss them. Abstract: A brief reflection on what might be becoming the traditional way of conducting information and digital literacy activities, together with some recommendations in order to move beyond these traditional grounds. This reflection is framed within this age of social media and draws upon information literacy concepts, tools, and experiences. By judamasmas in Research on 2014/07/26 .